In general, I can be a bit of a dusty snob when it comes to using gluten-free flour mixes instead of blending my own flours. The same blends don’t work as well for piecrusts as they do for pancakes, for example. But when I’m in the throws of entertaining and trying to impress with a delicious and usually ambitious brunch, I’m all for breaking out a shortcut or two. So when marketing I threw in a Bob’s Red Mill Gluten-Free Cornbread Mix into the basket along with the sun-dried tomatoes and thick-cut bacon to make for some friends at my family’s house in Connecticut. 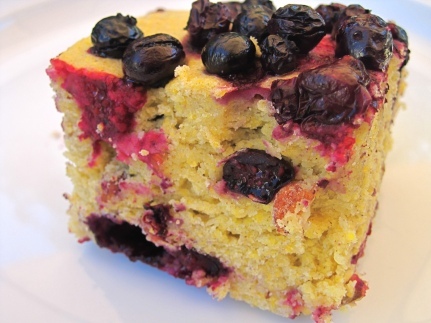 This easy and delicious gluten-free cornbread is perfect for a late summer or early autumn morning breakfast. I had it done from start to finish in 40 minutes – with plenty of time to whip up a frittata and breakfast potatoes. As I retype this recipe I can almost smell the changing of the seasons in the air, the warm sun on our backs as we celebrated on the porch, knowing that summer was coming to an end. Place entire bag of cornbread mix in the bowl of a standing mixer with the paddle attachment and add the eggs, milk and butter. Mix on low for about 30 seconds until just incorporated, then increase to high for another 30 seconds. Remove from the mixer and gently fold in the nuts. Fold in about ¾ of the blueberries, being gentle not to break their skins. Gently pour the batter into the pan and smooth out the top. Bake for 28 minutes or until firm to the touch. ** Substitutions: You can easily make this recipe completely dairy-free by substituting the butter with Earth Balance butter flavored vegetable blend, and replace the eggs with powdered egg replacer. Soy, skim cow or rice milk can be used instead of almond milk – just use an unsweetened milk so as not to alter the sweetness of the bread. I came across your site from the foodieblogroll and I’d love to guide Foodista readers to your site. I hope you could add this blueberry widget at the end of this post so we could add you in our list of food bloggers who blogged about recipes with blueberries,Thanks! I found your site from pinterest, and have enjoyed looking through some of your desserts. Unfortunately, quite a few of the desserts tagged vegan have either honey and/or eggs. Bummer.